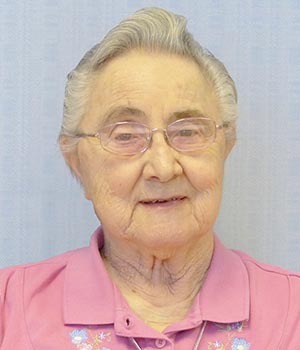 Her hobby of weaving is a metaphor for the tapestry of the life of Sister Mary Marjorie Packer (Sister Mary Vera). We reflect on the many threads that wove her life into the intricate, beautiful pattern of the person we knew and loved as Margie. The foundation of her whole life, seen as the loom, began with her love for her mother Katherine Cooke Packer and her sister Betty who was four years older than Margie. Her father was William Elwell Packer. Summer visits to her grandparents were special times at the farm. 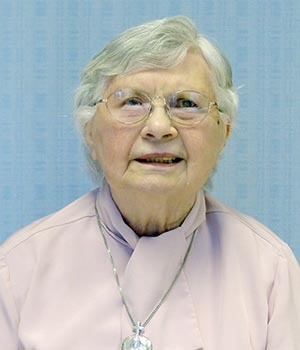 This family love was broadened by her deep faith and cherished as her Protestant roots enriched her broad view of God and church. 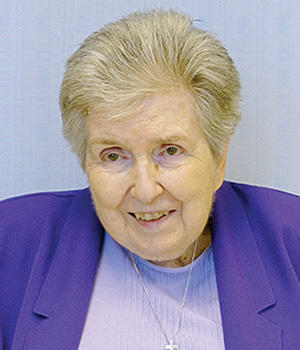 Margie was forever grateful for her conversion to Catholicism as young adult. 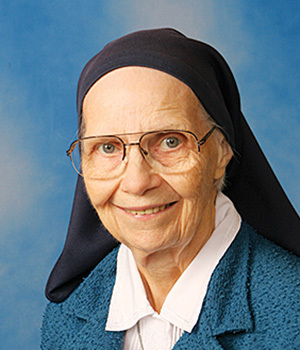 Columbus, Ohio, was central, as her birth place in 1921 and as the location for her education at Mount Carmel School of Nursing, where she met the Sisters of the Holy Cross. From there she entered the Congregation in 1949. Her life-long desire to serve and to do for others. 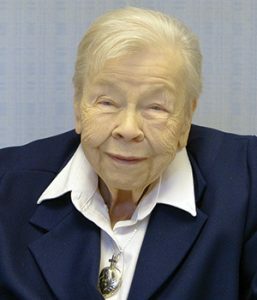 After working three years for the State of Ohio, she served her country for three years during World War II in the United States Naval Reserve (Women’s Reserve) better known as the WAVES. She was a yeoman first class performing clerical work with top security clearance. 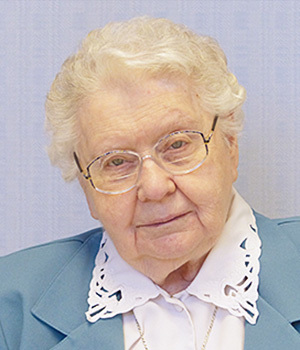 Her desire to be a missionary and to be the “hands of God” led her to continue her service by choosing nursing. Relationships were crucial for Margie. 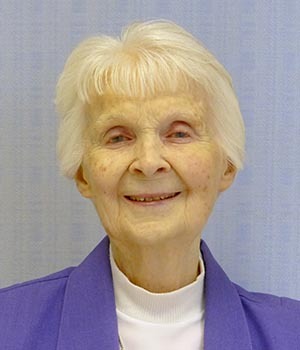 Her relationship with God was deep, obvious and inspiring. Her relationships with friends and co-workers were loyal and long-lasting. The sparkle in her eyes, her welcoming smile and the other-centeredness in her heart drew people to her in ways she never quite understood. Community was central for Margie. She valued being together as well as having alone time. She loved to share. Gifts and treats were shared with the next persons who entered her room. 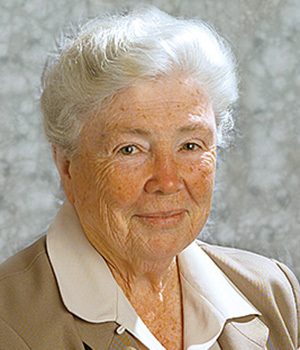 Ministry concretized her desire to serve and included: nursing, medical records administration, director of nursing and administrator here at Saint Mary’s Convent, acting director of the Solitude at Saint Mary’s, service at Madonna Manor, Salinas, California, and information services coordinator for the General Council. Margie enjoyed fun times together, such as eating tacos at Taco Bell and fried mush suppers. Margie loved to grow and to learn. 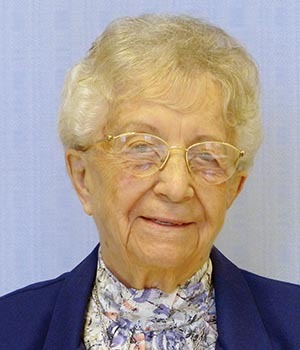 Her lifelong love of reading was exemplified in the monthly blue bag of library books delivered to her room, one of which was in her room when she died. New hobbies replaced boring old ones. She was famous for her stealthy, frequent rearranging of her room at night. Watching the news and keeping up with politics never bored her. Gratitude for every blessing in her life, including help from and relationships with the caregivers who loved her. Margie has been described as generous, dependable, quiet, honest, conscientious, attentive to details, having a very pleasing personality, kind, humble, authentic, a person of integrity, private, a good team leader and team player and full of common sense. In these later years she focused on ways to continue finding meaning in her life—even amid health challenges and letting go—and practiced coping rather than to complaining. Margie’s artistic talent and creativity were expressed in painting, wood carving, crocheting, knitting, weaving, polishing rocks, creative writing and poetry. Her appreciation for and curiosity about nature was evident in outings to the country wherever she lived. She enjoyed adventures in the Idaho desert with her rock hound club and backpacking a 12-mile hike in the Sawtooth Mountains. She loves cats of any kind, like the stray cat Princess in Salt Lake City who climbed stairs, crossed several roof pitches and scrambled through a tree to secretly visit Margie in her third-floor bedroom. We have remembered some of the highlights about the Margie each of us knew, experienced and loved. A letter she wrote to all of us adds the final thread to the tapestry of her whole life. In recent times a focus for me has been not prolonging life, but embracing the end of life. As I reflect on this it would be remiss of me not to tell each of you what a joy it has been to be in Holy Cross with you. God has been very good to me all of my life and has even given me added bonuses such as finding the true church and finding the true congregation. I am grateful to God and to each of you. Your kindness and your support during my life in Holy Cross is deeply appreciated. I thank all of you for your help in living religious life and I ask pardon for any which I have offended during this life. She took me back so tenderly. Thank you again and I love each of you.